Breach and breach; what is breach?! Annoying, is what they are, and they cause a lot of confusion. One point: is having your email address appear in a breach a death sentence? Speaking of annoying, Windows Update works for most people, but when it doesn't it can leave a path of destruction and confusion. What to do? Shall we clear up more confusion? An unexpected F11 can make a few things "disappear". Denver, April 2: Will you be at the meetup? I will! A few of my entrepreneurial pals and I are hosting one. We'll give short talks on a variety of topics, followed by general Q&A and networking. Interested and available? Click here for more details and sign-up. It's free, and includes pizza! Do I Need a New Email Address if Mine's Involved in a Breach? My email address was in one of breaches we keep hearing about. Is that address still safe to use? Should I get a new email address? There's no need to get a new address just because your email account was part of a breach — as long as you can still log in to your account. There are steps you should take, but that's not one of them. If you can't log in to your email account any more, though, you may have no other choice. Continue Reading: Do I Need a New Email Address if Mine's Involved in a Breach? Microsoft updates are getting to be a pain in the neck, but yesterday they really got to me. Many programs I use for business, and personal use were no longer functioning. The main concern I have is the loss of Corel products, especially WordPerfect, I was wondering why Corel was hit so bad. I suspected Corel had something to do with this crash since my Corel products are very old, 2004, and thought maybe they wanted me to buy newer software. I am simply frustrated and will accept any guidance you will suggest. I really don't know what to do, I have uninstalled most of the Corel products and WordPerfect appears to be working, but I have lost most of the products that were included on the 2 CDs in the package. While it's not as common as the headlines might lead you to believe, this isn't the first time I've heard of the scenario you outline: Windows 10 updates itself, and you find that other software on your machine has stopped working. Often it's older software you've been using for years without a problem. I can't guarantee a fix, of course, but I'll outline what I would do in this situation to maximize the chances of everything working again. Continue Reading: How Do I Clean Up After Windows Update Breaks Other Applications? How Do I Get My Web Browser's Menu and Toolbar Back? From your description, I'm going to assume you mean that all this is happening within Internet Explorer, though similar features are present in other browsers (as well as other applications). It's easy to accidentally hide menus and toolbars. I'll examine those, and show you how to get your toolbar, menu, or whatever it is that you're missing back. Continue Reading: How Do I Get My Web Browser's Menu and Toolbar Back? 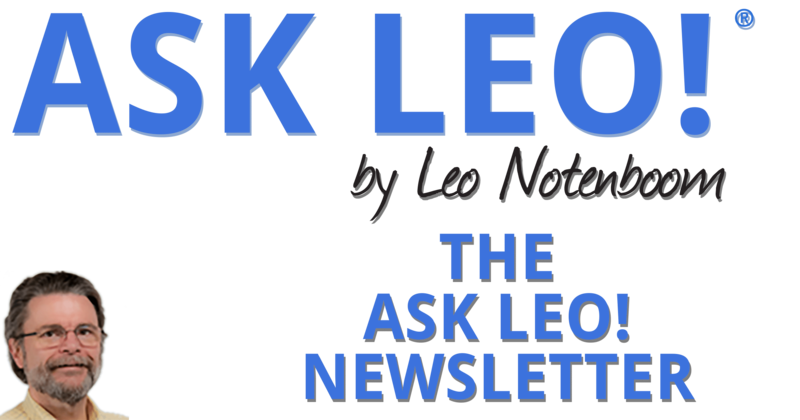 Previous Post: « Ask Leo! #747 – Do I Need a New Email Address if Mine’s Involved in a Breach?